The HDS-9364 is our professional-grade HD over Coax bullet camera, delivering high quality HD 1080P video with an adjustable zoom lens and excellent infrared night vision up to 100' in pitch black. This heavy duty armored bullet camera clearly lets people know they are being watched, and watched they are, in clear 1080P HD video. This HD-SDI (HD over Coax) style camera provides great quality color video during the daytime, then switches to black and white at night with infrared night vision up to 100' in Pitch Black conditions. This camera is housed in a heavy duty armored and weatherproof bullet housing with 3-axis adjustment for easy wall or ceiling mount. The HDS-9364 camera also has a built-in analog output, allowing it to be used at standard definition to plug into a traditional DVR (at standard resolution) or a public display monitor. This Pro-Model 1080P HD Armored Bullet is great for your home or business. 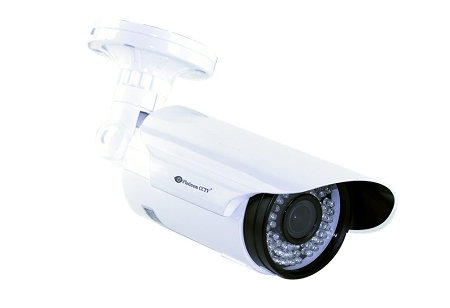 We had some cameras in our warehouse already, that were run with coax cables. We stopped in Platinum CCTV to take a look at our options for going HD, and Michael steered us towards these HD cameras. This camera has been great for daytime and night and wow is it clear. Q: Can you connect this camera to a TV for public display? The Yellow analog output can be used at the same time as the Green HDSDI output. 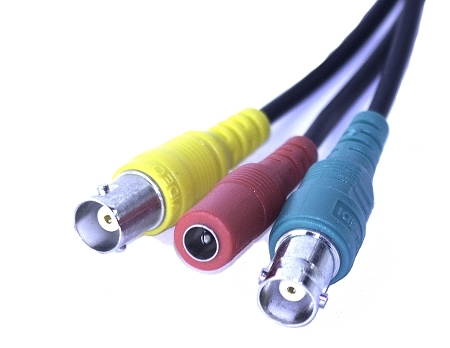 So if you want an analog display (or to connect it to an analog DVR) then you can use the yellow connector. For the full HD output in 1080P, connect the green connector to your HDSDI DVR.